Here are a few simple things you can do to treat your tresses right before you go out to paint the town red (literally!). The festival of Holi is upon us, and everyone is all set with their packs of colors and water balloons. The jalebi batter is ready and the old clothes that need to be worn are laid out. Everything is good to go, but are you? Have you taken the necessary steps to protect your hair from the powders and chemicals which could cause damage to your gorgeous mane and scalp? 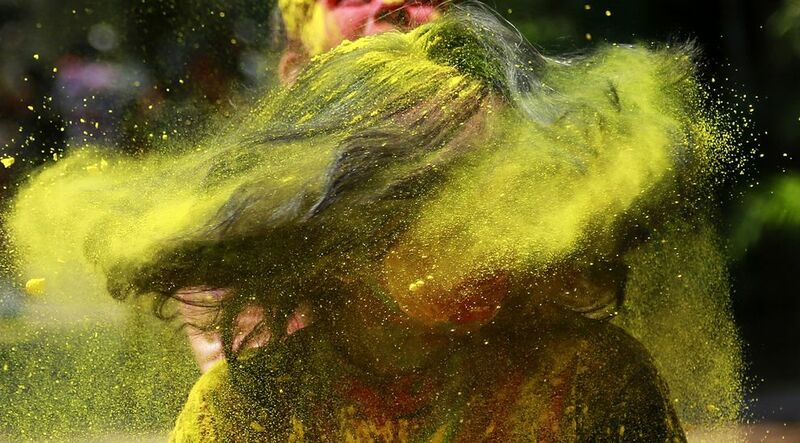 The colors used of Holi are mostly in the form of powders which easily settle on the scalp and the strands of your hair. Direct contact with the surface and follicle causes the stands to dry out and can even lead to an itchy scalp. It is important that you are well prepared to avoid any trouble once the celebrations are over. Here are a few simple things you can do to treat your tresses right before you go out to paint the town red (literally!). Many people feel that it’s best to just wash the hair after playing Holi. But in fact the natural hair oils that are secreted a day or two after a hair wash hold on to the grime and color affecting your scalp more. Instead wash your hair the night before and let it air dry. Apply a root mask to protect and strengthen the scalp. Also remember to deep condition so that your hair doesn’t dry out. The importance of oiling your hair before you step out to play is something we have all heard from our mothers and grandmothers. And they were not wrong. The oil forms a protective barrier and stops the color from directly harming the scalp. Mix one part of castor oil in a two parts of coconut oil and apply to your hair and scalp at least an hour before you head out. The castor oil is thick and coats the hair strand well. Once you have oiled your hair thoroughly, dip a towel in a bucket of hot water and let it get thoroughly soaked. Squeeze all the water out and wrap the hot towel on your head. Leave it on for about half an hour so the oil permeates through the scalp and hair root and seals it well. You can’t stop the color from falling on your hair, but you can minimize the effect. Now that your hair is washed, oiled and nourished, tie it up in a tight braid to reduce the amount of color that will settle. Leaving your hair open or even just putting it up in a ponytail leaves ample room for the powders to settle on the strands as well as the scalp. You can try fun versions like the fishtail or the waterfall braid for a stunning look even when you hair stays safe and protected. Follow these simple steps and you will have no trouble washing the color right off. Get ready to dazzle and be the envy of others when you are flaunting your luscious locks even at the after party.